The grassy pastures are composed for the larger part of certain grasses such as the Sheep’s Fescue (Festuca ovina) and the Matgrass (Nardus stricta). Besides these grasses man y species of sedges and rushes occur especially in damper areas. Naturally, heather and crow-berry cover large areas of the mountain slopes, but where they occur we have typical moorland vegetation and hence I shall deal with these species in the chapter entitled ’Moorlands’. Several species of flowering plants are also found n the grassy pastures. They have to contend with difficult problems of seed distribution due to the fact that the grasses tend to colonize vast areas to the exclusion of the other species. We shall find that plants living in the grassy pastures are perennial and, by means of climbing or tall stems, overtop the grasses in order to display their flowers well above the grassy screen. 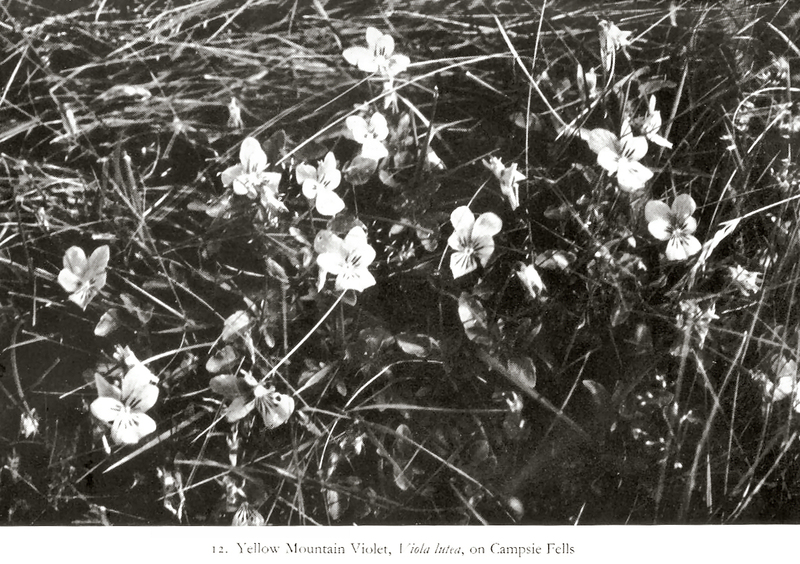 One of the most beautiful plants to be found in the grassy mountain pastures of the western Highlands is the Yellow Mountain Violet. It is one of the loveliest species and is a very interesting plant. It possess a short, underground stem in which food reserves are stored. This stem branches and hence can give rise to several plants, leaves and flowers being produced from buds at the tip of each branch. In order to colonize as much land as possible, the rhizome gives rise to long, creeping stems called runners; these pass between the stems of the grasses and other plants and so reach favourable places at considerable distances from the parent plant. It then sends out roots into the soil from its nodes. Once these have penetrated the soil, leaves are produced and eventually flowers. In time the portion of the runner connecting this daughter plant to the parent dies and so an independent plant is formed. This in time sends out runners and so eventually large areas are colonized. As a further aid to invasion of new territory, the fruit of the violet have a special mechanism by which the seeds are forcibly expelled to a considerable distance. It will thus be realized that this plant is very well equipped for the life struggle. To this must be added the beautiful, highly specialized flower which are constructed for cross-pollination by bees. The lower petal of the flower is much large than the others and acts as a landing stage for the bee; it is also prolonged backwards as a spur in which the nectaries are concealed. The spur can only be approached through a very narrow passage between the stamens and the base of the petal. As if this were not enough to deter unwelcome visitors, the bases of the petal are hairy to further obstruct the entrance. Around the pistil are five stamens which have short filaments and whose anthers are applied closely to the top of the ovary below the stigma. They open inwards and their pollen is drier than n most insect-pollinated flowers. The stigma is a knob-like projection on the summit of the ovary, with a tiny flap projecting downwards from the lower side. From the two lower stamens two white nectarines project back into the spur. When a bee visit’s the flower it alights upon the lower petal and, guided by its dark begins, pushes it had into the entrance of the flowers. On so doing, any pollen on its head will adhere to the stigma which obstructs its way. Its head will only go a short distance beyond the stigma, but then it is below the anthers and as it pushes its tongue down to the nectaries, it disturbs the stamens causing the dry pollen to rain down on its head. There is no danger of this pollen being left on the stigma as the bee withdraws its head, because the tiny flap at the base of the stigma is forced up over it and prevents any pollen touching it. Through this marvelous mechanism, the violet assures cross-pollination and makes sure that its nectar will only be accessible to its particular benefactor. The violet also produces tiny green flowers, which never open. They contain stamens and a pistil and are self-fertilized. These flowers are know as cleistogamous flowers and are fairly common in the plant world, occurring in the White Dead Nettle, the Balsam and Wood Sorrel in addition to the Violet Family. The advantage to the plant of these flowers is that, if bad weather prevents bees visiting the showy flowers, some seed is certain to set by the cleistogamous ones. In the mountains this must often be the only seed set. The fruit is a three-sided capsule and when ripe it becomes erect. On a dry sunny day it splits into three by means of three valves. The seeds are then collected into three boat-shaped compartments. The wall then dry and contract, so squeezing the seeds together and eventually the inner ones fly out, often to a considerable distance. As much as three feet has been measured. Two members of the great Umbelliferous Family are to be found in the Highland pastures. They are the Spignel (Meum athamanticum) and the Sweet Cicely (Myrrbis odorata). They are both very attractive plants and are highly aromatic; the leaves, stems and rootstock containing sweetly smelling oils. The both possess large, underground stems, which store up large quantities of foodstuff in the form of starch and oily substances. This reserve allows them to commence growth as soon as favourable weather returns in the spring. They produce a tuft of large leaves which are highly dissected. In the case of the Spingnel, the leaf segments are almost hair-like, but the Sweet Cicely they are very similar to those of the Common Cherbil or Cow Parsley so common in the lowlands in spring and early summer. The tuft of spreading leaves keeps competitors from encroaching upon the immediate surroundings of the plant. >From the midst of the leaves arises a tall flowering stem, which in the case of the Sweet Cicely may be three feet high and branched. The tall stems easily overtop the grasses and other plants of the pastures. They are also very strong with ribs of hard woody tissue running down the sides and they are also hollow (and as we now tubular construction gives the greatest strength with the least material). They are thus well able to support the large flower heads and to withstand the wind which so often sweeps their exposed habitat. As the summit of the stems and branches, are produced large heads of flowers, constructed after the typical fashion of the Umelliers. From the summit of the stem radiate several stalks or, as they are called, rays; in the case of the Spignel there are ten to fifteen rays, whilst in the Cicely there are rather more. Each ray reaches the same height and at its ummit gives rise to a similar number of shorter rays, called the secondary rays. Each of them produces a single flowers and as they reach the same relative height the resulting head of flowers is a flat, table-like structure. This form of flower head is called an umbel. In the above case the flower heads are actually umbels are several spreading bracts which help to impede creeping insects from reaching the flowers. The flowers are small with five white petals arranged around the fleshy summit of the flattened ovary. This produces nectar quite openly upon its surface and it is easily obtained by short-tongued insects. The large numbers of flowers in each umbel make them very conspicuous and they are visited by hosts of insects. Many kinds of lies, some beetles, short-tongued bees, wasps, butterflies and hover-flies visit them At first each flower is male only as the two stigmas are not mature until all the pollen is shed. Large quantities of cross-fertilized seed are set. Each flower finally produces a single winged fruit containing two seeds. After fertilization the ovary walls enlarge and produce a wing all round the edge. The seed itself is surrounded by vessels containing aromatic oils which help to nourish the embryo and protect it from damp. When ripe the fruit splits down the middle and the wind transports the resulting halves to a considerable distance supported by their wings. It is thus not surprising that the above two plants are common and well distributed in the Highland pastures. This plant is quite common in grassy pastures and is closely related to the Persicarias and Snake-weed of the lowlands. It is a lowly plant with a tuberous underground stem acting as a storage organ. The stock is crown by narrow leaves with very log stalks. They are smooth and leathery in texture whilst the edges are recurved, thus covering, to a certain extent, the under surface and preventing excessive transpiration. The flower stems are about six inches high with a few small sessile leaves. The flesh-colored flowers are produced in a close terminal spike and are visited by flies and small bees, but are often self-fertilized. Very often, however, it will be noticed that the lower flowers are reddish, bud-like objects. These are bulbils, which are easily detached and, on falling to the ground, produce roots and leaves. This known as vegetative reproduction or as it is sometimes called, vivipary. The advantage of this to the plant is, that the long period of time between the opening of the flowers to the setting of seed is dispensed with. This may be vital importance in bad seasons when the flowers open late and cannot get through the usual life processes before winter arrives. 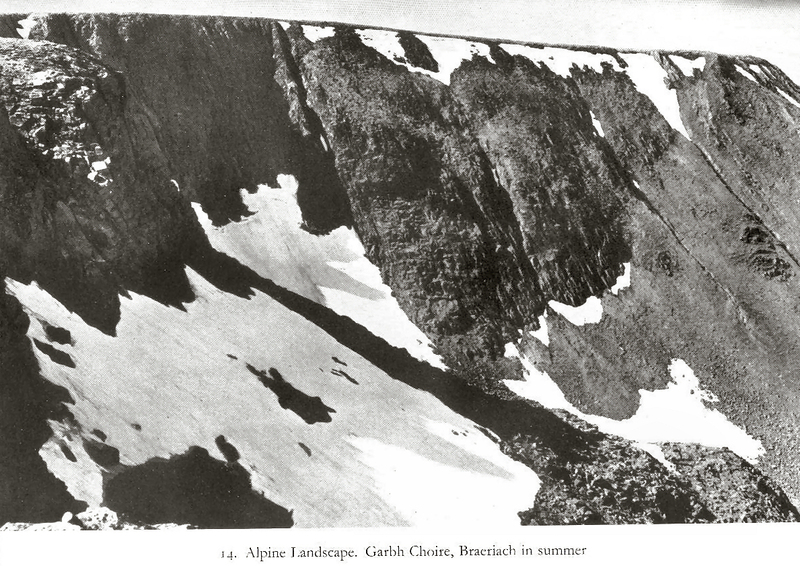 Several cases of vivipary occur among alpine plants. We have already come across it in the Drooping Mountain Saxifrage and shall find that several grasses have also adopted this short cut to reproduction. It must be remembered, however, that continued vegetative reproduction unsupported by the formation of ordinary seed lead to the gradual weakening and undermining of the race, and as we have seen, in the case of the Drooping Saxifrage, to it eventual extinction. This is quite a common plant in the mountain pastures and is probably only a starved mountain variety of the Common Juniper which will be described in Chapter XI. It is a very low shrub which has adopted as espalier growth and lies back against the soil. In fact, it is often almost a carpet plant. In all other respects, it is quite similar to the common Juniper. In lowly growth is, of course, an adaptation to climatic conditions, affording the plant protection against strong winds and the weight of snow in winter. the Yellow Oxytropis (Oxytropis campestris) and the Purple Oxytropis (Oxytropis Uranensis). The first two are rare plants, the former confined to the mountains of Perthshire and the neighbourhoods of Braemar and Clova, whilst the latter is only known in the Clova Mountains. The third plant is rather more frequent, being often found at quite low levels, especially near the sea. It is usually found on grassy mountain sides, growing on stony patches and in rock crevices as well as among the short herbage. This small plant, with a creeping stem which may attain one foot in length, is usually branched near the base. The branches give rise to several leaf stalks which support compound leaves consisting of eight to twelve small, oblong leaflets, with an odd one at the top of the stem. They are slightly silky. From the axils of the leaf stalks arise long flower stalks which are terminated by snort, close racems of bluish-purple or white, tipped with purple flowers. The structure and pollination of these flowers will be found fully described under the Broom (see Chap. XIV). In that same chapter, I shall deal with the phenomenon of symbiosis in Leguminous plants. It is very rare and only those who know its actual flowering stations have much hope of finding it. This plant is one of those very rare and very local mountain plants which, like Lychnis alpina, elect to flower in one solitary spot in the Highlands. Why this should be is a mystery, as there are many other places equally suitable for its growth. It is a perennial with a short, tufted rootstock. The lower part of the stem is covered with the old stipules and leafstalks of other seasons, which help to protect the stock against frost and damp. The leaves and flower stalks arise from the extremity of the stock. The leaves consists of ten to fifteen pairs of small ovate leaflets with an odd one at the tip of the main rib, and are hairy, especially on the lower surface, the stomata thus being protected against excess transpiration. The flower stalks are rather long and are terminated by a short spike of pale, yellow flowers which are sometimes tinged with purple, especially in the lower part. They possess a short, hairy clayx which protects the flowers admirably whilst in bud. After flowering the Yellow Oxytropis produces short, swollen oval pods which are produced to a fine point, and are covered with thick, black hairs which protect the sees from rain and amp. This plant is much more common than the other two Leguminous plants already described, being frequently found on grassy mountain sides and sometimes descending to sea-level near the sea. It is similar in habit to the Yellow Oxytropis, but is densely covered with soft, silky hairs, and is hense much better protected against drought. The flowers are a bright purple. The next group of plants, which is to be found in the drier areas of the grassy mountain pastures, includes three plants of rather similar habit. The first, the Tormentil (P. erecta), is an abundant plant in the lower part of the pastures; it is, of course, a very common lowland plant. The second, the Mountain Potenilla (P. alpestris), is a much less common plant which is found here and there, especially in the southern Highlands. The third, the Sibbaldia (P. Sibbaldia), is very common in the higher pastures, often covering large tracts of the mountain sides. This very abundant plant is too well known to require a close description, but it is cleverly adapted to dry situations. It has a thick, woody, perennial stock which is well able to defy the cold and damp of winter, and from it arise several long, branched stems which may be erect or procumbent at the base. They climb over surrounding vegetation until, when they are clear of obstructions, the flowers are formed. They are clothed with many leaves, the lower ones of which are stalked and consist of five ovate, coarsely toothed leaflets which radiate like the fingers of the hand. The upper leaves which are most exposed to the sun and wind are reduced in size to limit transpiration. This plant is again more or less silkily hairy. The flower stalks arise in the axils of the leaves and are terminated by several small, bright yellow flowers, which usually have only four petals. If we examine the flower, we shall find that in the centre is a conical receptacle on which is situated a large number of one-seeded carpels. Around this central disc are situated the nectaries, and around them a circle of many stamens whose anthers face outwards. An insect usually alights upon the centre of the flower and naturally leaves transported pollen upon the stigmas, but on turning around to lick the nectar ring it becomes dusted with pollen from the anthers. As they face outwards and away from the stigmas the danger from self-fertilization is small. The flowers set an abundance of small, light seeds which are blown to a considerable distance by the wind. Small bees, flies and hover-flies are the chief visitors. A plant so well adapted to conditions and setting an abundance of cross-fertilized seed is well on the road to success. 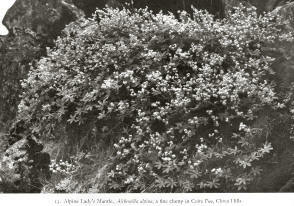 This explains why this plant is so common in the lowlands as well as in the mountain pastures. This plant is rather similar to the preceding. By some botanists, it is supposed to be a distinct species, while others think that it is a variety of the lowland plant, the Spring Potentilla. (P.verna). As in the case of the Tormentil, it has a perennial stock from which arises an erect stem which may be eight inches in length. The lower part is clothed with long, stalked leaves which consist of five to seven large, ovate, toothed leaflets. The upper leaves are smaller, with short stalks and with five or only three leaflets. They are covered with silky hairs which are sometimes so abundant as to give the leaves a grayish appearance. The flowers in this species are large, and of a bright, golden yellow, with five petals, sometimes spotted with pink or white. They are much more conspicuous than in the case of the lowland species. This is, of course, related to the fewer insects such as bees in the higher area. This is a rather different plant from the foregoing. The perennial stock forms a very dense, spreading tuft, clothed with small leaves consisting of three wedge-shaped leaflets which are green, but hairy on both surfaces. The tuft passes the rigours of winter beneath the snow whose weight its structure is well able to support. The low growth and small hairy leaves are, of course, adaptations against drought which may be very severe in its exposed habitat. The tufts give rise to short, naked, flowering stems which are terminated by small, greenish inconspicuous glowers, possessing five very small yellow petals. The green calyces are the most conspicuous part of the flower. The flowers do not produce nectar and, although they may be visited by small flies, are probably self-fertilized. 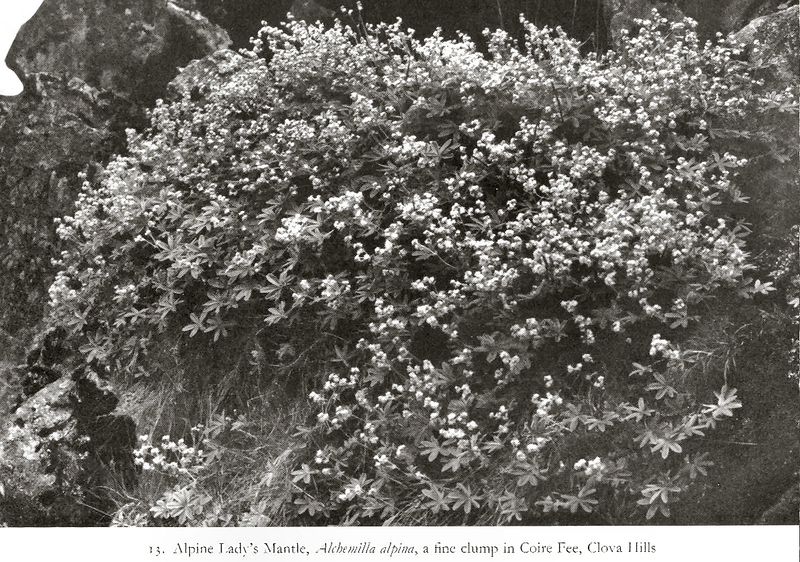 The most frequent Lady’s Mantle to be found in the mountain pastures is the Alpine Lady’s Mantle (Alchemilla alpina). It is sometimes very abundant, forming large colonies, and can be met with at over 4,000 feet. The perennial stock sends out creeping runner with root at the nodes. The flowering stems are usually creeping and attain six inches or more in length. This stock is crowded with long, stalked radical leaves which are divided to the base to form five or seven oblong segments or leaflets. To guard against excess transpiration the stems and leaves are covered with beautiful, shining, silver hairs. The flowering stems are terminated by spikes of small greenish flowers in which there are no petals, the double calyx taking their place. Another alpine Lady’s Mantle is Alchemilla aseptic, which is much less common but frequents similar places to A. alpina and may also be found at over 4,000 feet. It is easily distinguished from the former by its large, kidney-shaped leaves which are quite undivided. Its small, yellowish-green flowers are produced in clusters at the summits of the stems. with leaves of the same form, but they are covered with soft, downy hairs on one or both surfaces. A further distinguishing character is the hairs on the stems which spread outwards in A. Vulgaris, but lie flat in A. alpestris. This tiny plant belongs to the aristocratic Orchid Family. This must come as rather a surprise to my readers, for there is nothing very conspicuous or unusual in the tiny spikes of brownish-green flowers. One must search for it carefully in the higher mountain pastures, for although I have found it at only 900 feet in Lochaber, I have found extensive colonies in the grassy hollows of the Cairngorms at nearly 3,000 feet, nestling so deeply into the mosses and alpine herbage that they were only discernible with difficulty. The roots of this plant consist of a mass of thin fibres and are not tuberous as in most of our native orchids. From the stock arises a single, slender stem to about six inches in height. About two inches up this stem are produced two broad, opposite leaves which are never more than one inch in length and are heart-shaped at the base. These are the only leaves that are produced. The stem is terminated by a short raceme of very small flowers, the upper petals and sepals of which are spreading, but the lip is long and very narrow, cleft into two at the extremity and bearing two tiny teeth at its base. I shall deal with the pollination of this orchid in a later chapter. The species of grasses making up the actual mountain pastures depend largely on the soil and its water content. Where drainage is poor and the soil is acid-peat with stagnant water, as occurs on large areas of the more gentle mountain sides, then the grasslands are dominated by the Mat-grass (Nardus stricta), which, as we have already seen, penetrates even into the alpine zone. Its creeping rhizomes are almost on the level of the soil and the vast number of individual plants dispute every inch of soil They creep over each other, and as the under plants are smothered so a deep mass of dead rhizomes and roots is formed. The thick, mat-like colony invades all the surrounding pasture, until large area are under its sway. It is admirably suited to its habitat as the thin, wiry leaves are little sough after by grazing animals. Its roots contain a fungus which breaks down the peat and humus and makes it available to the plant. Its huge colonies are almost impenetrable to other species. A well-established Nardus grassland, however, usually furnishes a habitat for one or two other grasses. Thus the Wavy Hair-grass (Deschampsia flexuosa) is often found in the dense mats, its shallow roots finding sustenance in the soil which collects around the tussocky Nardus. This plant we have already met in the alpine pastures, so a further description is unnecessary. Certain species of Agrostis, the Bent-grass, also grow in these areas, the most common being Agrostis canina, a densely-tufted grass with narrow, flat leaves. It also forms colonies by means of long runners. Agrostis stolonifera, a similar species with rather wider leaves, and A. tenuis, with difficulty distinguished from the latter, may both be found with Nardus. They are characterized by their flowering stems whose dry, stiff, erect remains are in evidence long after the flowers have withered and the seeds have been distributed. Where the slope is greater and running clear water is in evidence, the Nardus grassland gives way to that dominated by the Blue Moor-grass (Molinia vaerulea). This also forms pure grasslands of great extent to the exclusion of other species. It has a short rhizome giving rise to large tufts of long, flat still leaves. The flowering stems bear two sets of similar leaves, separated by a basal internode which acts as a food store. The leaves are deciduous and drop off the plant in the autumn. They, of course, form a dense humus which in time composes a soil dry enough for other grasses to penetrate. A frequent colonist in this type of grassland is Deschampsia caespitosa, which also forms dense tussocks of long, flat leaves whose rough edges cut like knives if handled carelessly. It produces an elegant panicle with many slender, spreading branches covered in silver-grey or purplish two-flowered spike lets. Another abundant grass-like plant in these areas is the Deer-grass (Scirpus caespitosa). This is actually not a grass at all as it belongs to the Sedge Family (Cyeraceae). It is also a densely tufted plant giving rise to a large number of erect, green structures which might be mistaken for leaves, but are actually steams. The leaves are reduced to short, brownish sheaths at the base of each stem. The stems contain chlorophyll and carry on the photosynthetic functions of the plant. Each stem is terminated by a tiny, ovoid, brown spike of flowers. A number of read Sedges (Carex) are also found with Molinia, the chief species being C. dioica, C. flava, C. panicea, C. Goodenowii and C. stellulata. Where much stagnant water occurs, the Cotton Grass (see chap. XV) often supplants Molinia. Other grasses of the mountain pastures are the Sweet Vernal-grass (Anthoxanhum odoratum) already described in the alpine section. Sieglingia decumbens is another common grass of tufted habit. It is usually from six inches in height and its narrow nleaves have a few, long, soft, white hairs on their sheaths and edges. It produces a small raceme of only five or six spike lets, each of which contains three or four flowers. The Meadow-grass (Poa pratensis) is often present and it establishes itself by means of a creeping underground rhizome and overground runners. It thus colonizes large territories in a short period. It produces a large panicle of slender, spreading branches covered with numerous small, green spike lets. The Annual Meadow-grass (P. annua), so common everywhere, is also found in the mountain pastures. The Fescue-grasses (Festuca) are often present and F. ovina is often abundant, covering large amounts of land. Its variety F. alpina was dealt with n the alpine section. It closely resembles it, but does not form viviparous spike lets. The Red Fiscue (F. rubra), a taller species with flat leaves and a reddish-panicle, is also widespread. One other grass-like member of the mountain pastures is the Heath Rush (Juncus squarrosus),often found with Nardus. It is a tufted plant with several stout, erect stems about one foot in height. The radical leaves are very narrow and deeply grooved with the stomata on the inner surface of the groove. The stems are terminated by a panicle of glossy brown flowers.